Find your spot, close to the action, to see the "... first launch to another planet from the West Coast." Find your spot, close to the action, to see the "... first launch to another planet from the West Coast." The date is Saturday, May 5. Viewing area opens at 2:30 a.m. Experiencing excitement in the early morning, as in the very, very, incredibly early morning? You've likely felt that particular feeling if you've risen before dawn for a hot air balloon festival, or a marathon, or another event that is built around the wee hours of the morn. Another such happening is on the near horizon, and we do mean "horizon," as you'll be staring up into the sky, and out into the distance, as you see a bright light blazing into the cosmos as it speedily leaves Vandenberg Air Force Base, Space Launch Complex-3. 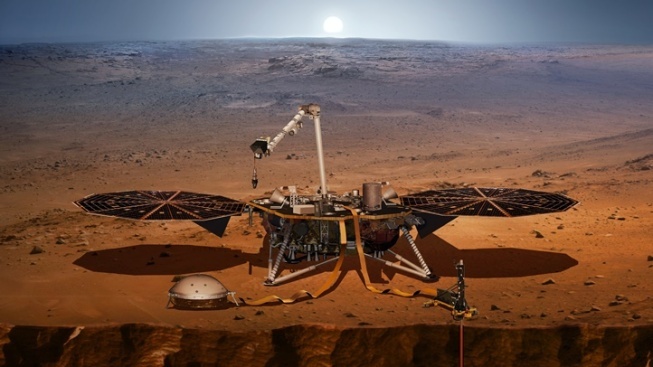 It's the Mars InSight Mission we speak of, the "... first launch to another planet from the West Coast." The lander, which will be traveling on an Atlas V-401, is set to "... study the interior of Mars and listen for Marsquakes." Neat, neat, neat. And a thousand more "neats" beyond those three should handily encapsulate the magnitude of this mission. The sheer neatness of the launch ensures that fans of anything related to space, of major launches, and of interplanetary milestones shall be out, well before the sun shows up, on the morning of Saturday, May 5 to bid InSight farewell and good luck. Issues, like weather- and tech-oriented haps, can delay the launch, do note. Where to go to see this glorious sight, a moment very much woven through with optimism, the future, the amazing advancements of science, as well as a little Martian moxie? A lot of up-early Californians will see the sky show, even those located far from the launch sight, but Lompoc Airport has been deemed the launch's "official viewing location." Eager to be in the center, or a center, of the action? Head for 1801 N. H Street in the Santa Barbara County town, but be sure to arrive at 2:30 a.m., or after, for that's when the gates open. The launch is scheduled for 4:05 in the morning, and NASA, the Jet Propulsion Laboratory, and the United Launch Alliance are all working in partnership to make sure lift-off is successful and smooth. It won't simply be straight-up waiting around at Lompoc Airport, however, as the clock ticks down. "Visitors will be able to see the launch, watch NASA TV commentary from the tarmac, and meet NASA/InSight mission team members and city representatives." There's a second viewing location, nearby, at St. Mary's Episcopal Church. Hotels in the area can book up quickly for such events, so get info on finding a Lompoc-based bed for the night, or, well, the half-night. And find times, addresses, and more information on watching the launch at Explore Lompoc. Keep in mind, too, that there's a Mars Roadshow, full of InSight info, in the days ahead of the launch, around the general Lompoc area. Find dates, times, and places for the science-minded meet-ups now.